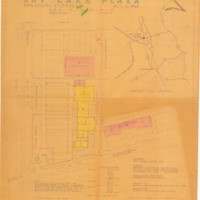 An architectural drawing showing the proposed layout of the Sky Lake Plaza, later named Skyview Plaza and sometimes referred to as the BeeLine Mall. Hymen Lake designed the plaza as regional shopping center, featuring a Publix supermarket and other mixed-goods stores in Sky Lake, a residential community and unincorporated area in Orange County, Florida. Skyview Plaza was constructed in 1964 and is located on the northeast corner of U.S. Route 441 (US 441), also known as Orange Blossom Trail (OBT) and Sand Lake Road. The developers dubbed this area the "Triangle of Success," formed by the City of Orlando, the Martin Company, and McCoy Air Force Base. Original 19 x 21 inch architectural drawing by Lathrop Douglass, October 4, 1962: Pine Castle Historical Society, Pine Castle, Florida. Digital reproduction of original 19 x 21 inch architectural drawing by Lathrop Douglass, October 4, 1962. Sky Lake Collection, Orange County Collection, RICHES of Central Florida. Originally created by Lathrop Douglass. Copyright to this resource is held by the Lathrop Douglass Architects and is provided here by RICHES of Central Florida for educational purposes only. Tracy, Jane. "Harriett and Hymen Lake .'" Orlando Memory, March 11, 2014, http://dc.ocls.info/memory/image/harriett-and-hymen-lake. Palmer, Jottie. "Big Shopping Mall Planned." The Orlando Sentinel. March 31, 1966. Douglas, Lathrop. 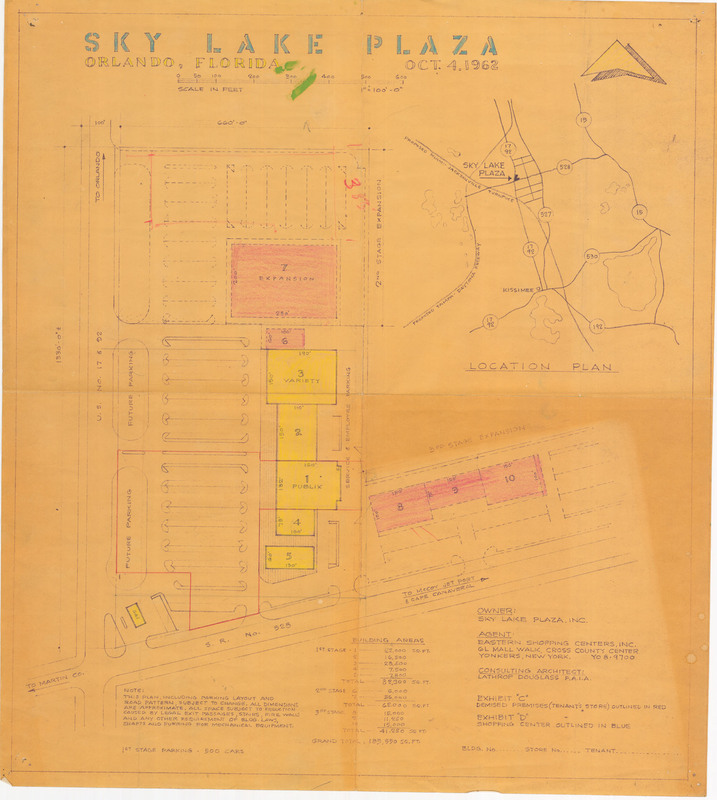 “Sky Lake Plaza Site Plan, 1962.” RICHES of Central Florida accessed April 21, 2019, https://richesmi.cah.ucf.edu/omeka/items/show/7462.